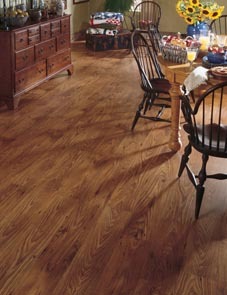 When homeowners are looking for premium hardwood selections, they know to visit Foothill Carpet Flooring America. Beloved by homeowners of nearly all tastes and preferences, hardwood flooring offers a classic look that many covet. However, they are some areas of the home that aren’t well-suited for natural wood flooring. Fortunately, shoppers will have little trouble finding a vast array of materials in our fully stocked flooring showroom, including our engineered hardwood flooring in Rancho Cucamonga, CA. No matter what you’re hoping to achieve with your project, our specialists are prepared to help you find a suitable choice. Whether you're replacing your living room floors or laying new engineered wood flooring in a moisture-prone space, you can rest assured that we’ve got all of your bases covered. Though traditional hardwood’s natural beauty usually complements any room, moisture-prone areas such as basements, bathrooms, and kitchens aren’t ideal spaces for this highly sought flooring material. If you wish to replace the flooring in any of these areas, our engineered hardwood choices are an excellent alternative. Engineered wood flooring closely resembles traditional hardwood. However, they are comparatively more resilient. All wood floors contract and expand a bit due to changes in temperature. However, our specially treated hardwood selections minimize these reactions to ensure your new floors maintain their strength and sturdiness long after their installation. Durable to the core, our engineered hardwood flooring is composed of several layers of traditional hardwood fused and treated under extreme heat and pressure. This unique treatment helps them resist sudden humidity and temperature variations easily. Not only are they created uniquely, but these highly desirable flooring options can be floated, glued, or stapled in place. With so many different qualities to think about such as color and species, finding the right choice for your space could be somewhat tricky. That’s why our knowledgeable specialists are always ready to help shoppers find the right engineered wood flooring solution that perfectly meets their needs. Whether you’re looking for birch engineered hardwood or hickory engineered hardwood, you can count on our knowledgeable specialists to help you determine the right choice of grain and installation that would best suit your needs. Our commitment to our customers doesn’t end once they’ve made a selection that speaks to them. Turn to our skilled crew members for a comprehensive engineered wood flooring installation. You can rest assured that our experienced installation team will lay every inch of your new flooring material perfectly in place. Trust our capable specialists with your installation needs, and we’ll leave you with a solution that’s sure to offer the look and performance you demand. Contact our showroom to learn about our impressive selection of engineered hardwood flooring. We proudly serve home and business owners in Rancho Cucamonga, Alta Loma, Upland, Fontana, and Ontario, California.